What is an Amazon Product Rank? Amazon’s Best Seller Ranking (BSR) is the metric used to determine how well a product is selling in comparison to similar products within a given category. A variety of factors are used to determine a product’s rank; however, the primary component that affects the ranking is Amazon products sales history. The Best Seller Ranking is updated every hour to not only reflect historical sales data, but more importantly, current sales data. When a customer searches for a product, Amazon’s sophisticated algorithms determine which products best match the customer’s inquiry and present the most relevant product options to its customers. How does the Amazon Product Ranking affect my sourcing decision? The Amazon Product Ranking is a great resource to help you identify which products to sell on Amazon. A product that has a higher ranking (e.g. #1 in its category) means that is sells quickly, which is good, but is also typically a signal of fierce competition and low profit margins. When choosing inventory to sell, you should also try to avoid products with very low BSR rankings, meaning anything in the tens of thousands, since such products likely won’t sell well. It is indeed a balancing act to find the right ranking. But, if you can find a product that you see has potential market and profit opportunity, and room for you to optimize and improve its BSR, that is the sweet spot you should be aiming for. How Do I Find Product Rankings? 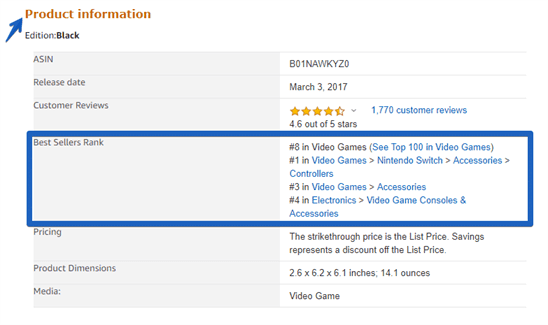 In order to find the Amazon product ranking for a given product, first go to any Amazon product page. Once you are on the product page, scroll down to the ‘Product Information’ section. On the bottom of the chart, you will see ‘Best Sellers Rank’ on the left hand side of the chart. Directly next to it, you will see the product ranking for each and every category that the product is sold in. Optimize your product listing: By providing relevant information in your Product Title and description, you will increase your product’s visibility, leading to an increase in sales. Price competitively: Pricing your products competitively will not only improve your chances of winning the Amazon Buy Box, but will also lead to higher conversion rates. Choose the right categories: To increase sales, price your products in categories where the competition is lower and you get more visibility. FBA fulfillment: Customers love Fulfillment by Amazon (FBA) products due to the free 2-day shipping. As customers prefer to buy from sellers that offer this option, it can help increase your sales and improve your product’s ranking. Utilize Keywords: Keywords tell Amazon when to consider your product for a search result. Increase your visibility by providing relevant and descriptive keywords throughout your listing. Amazon product rank tracking can help you narrow what products to source and monitor how products perform within specific categories. Amazon rankings can change quickly so they should be monitored frequently for products you are considering selling as well as for those that you have already launched. However, to make well informed sourcing decisions, sellers need more information. 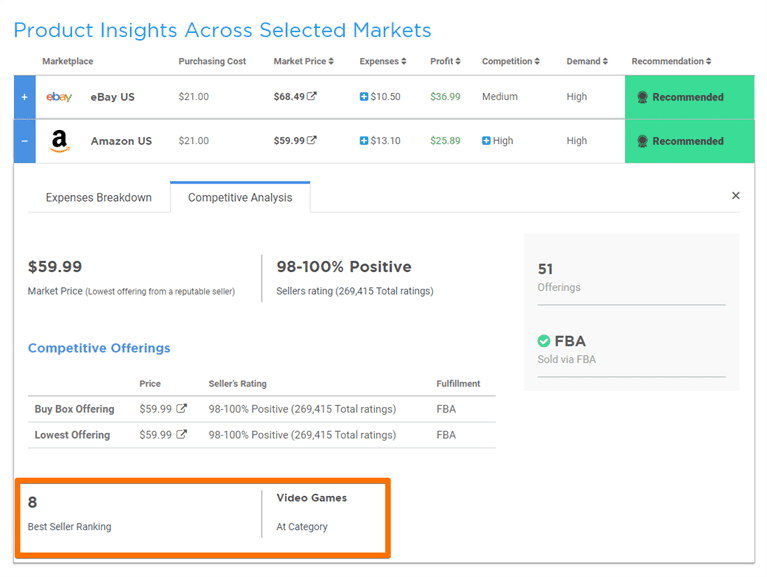 This is why Algopix’s Amazon product research platform enables sellers to get insights such as product demand level, selling price, cost breakdown of shipping, taxes and marketplace fees, expected profits, monthly sales volume (i.e., units sold) and the Gross Merchandise Volume. Algopix lets you get this information for your choice of 16 different marketplaces across Amazon, eBay, and Walmart, with the click of a button. This can be very helpful, for instance, if you bought a product and it becomes too competitive to sell for the required profit margins on Amazon US, you can quickly discover that you might have a more lucrative opportunity on the Amazon Canada marketplace or on the eBay US marketplace. For those of you just starting, check out our blog on how to open your Amazon store or get our eBook that can guide you through Getting Started Selling on Amazon today. Why not try a free 7-day trial? You have nothing to lose and everything to gain!